Collections in Lightroom are a very efficient way to organize photos independently from the folder structure. It is even better if you combine the functionality of the quick collection with normal collections. Doing so you can very quickly add photos to a collection from the library or develop module. In the section Collections of the left panel, scroll to the collection where you want to add your photos. 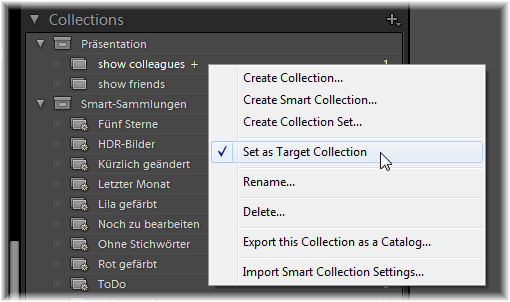 Open the context menu with a right click and select Set as Target Collection. The current target collection is shown slightly highlited and with a + sign after its name. Then change in the library module to the apropriate folder (grid view). It also works with the thumbnail view at the bottom. To add a photo to the target collection hover your mouse over the thumbnail and click on the little circle that is shown. The circle then stays active to show that this photo is in the target collection. If you click on the circle again, you remove it from the target collection. Even quicker is to use the keybord shortcut B to add all currently selected photos to the target collection (or remove them again). After you switch off the function Set as Target Collection, the Quick Collection is reassigned to the little circles on the thumbnail as well as to the shortcut B. The circles on the thumbnails always show the state of the current target or quick collection. And yes, of course: There are other ways to add photos to a collection. E.g. via drag&drop or by selecting the photos and using the context menu entry Add Selected Photos to this Collection in the collection. Or by using the quick collection first and then moving all at once to an other collection. But I think, if you want to add a couple of photos from different folders to one collection, this is a very quick way to do it. This was tested with Lightroom 4.4 but I guess it should work with Lightroom 5 too.